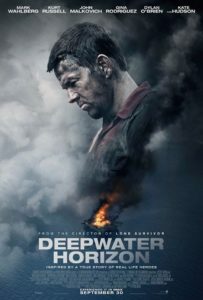 RYAN: This is based on the true story of the worst oil disaster in US history. I was so nervous during this movie that I – more than in any other movie – shouted out, “Oh God! Oh God!” during this film. I was cradling in my seat it was so upsetting. It’s such a disaster and crazy that it could have been avoided. I couldn’t believe how painful it was to watch, but like a train wreck, you cannot look away. NATHEN: And the fact it could have been avoided is frustrating. And the underlying theme here is that this disaster could have been avoided, if not for corporate greed. That’s the tone. I kept remembering that. Had the few execs not been so focused on the dollar, lives would have been saved. RYAN: BP is the company – I will never fill my car up with gas at a BP station again, after seeing this movie. It’s disgusting, how they are portrayed. RYAN: People cut corners to save money all the time; but not when lives are at stake. There’s a difference there. The stakes are different. Safety concerns on a construction site or oil rig – people can die. NATHEN: Absolutely. In medieval times, lives were the cost of war. This isn’t war. This is business. NATHEN: They didn’t value the risk of human lives. RYAN: BP – those greedy bastards! I can’t avoid Titanic comparisons here because it takes place on the water. It’s like Titanic meets Backdraft. It’s a horrible event and even though you know it’s coming, you cannot prepare for what you see. It’s claustrophobic, underwater, sinking, explosive feeling. NATHEN: The main difference is the fire. You can’t outrun fire. Water you can swim in, but fire is another level of danger. That’s a serious fear of mine. RYAN: It’s my greatest fear. And unlike Titanic, where it seemed they had a couple hours to know it would sink – in this film, it’s all very fast and there’s barely any time to think or try to survive. It’s all instinct. NATHEN: Yes. They had no idea what was happening. That element alone is horrific. RYAN: The effects are so good. NATHEN: Combined with the sounds, you’re pulled into it. It’s like you were there. RYAN: It’s so scary. This, to me, is scarier than a horror film because it actually happened and it’s real. This is why I choose to not work on the water. NATHEN: (laughs) One thing that kept ringing true to me was the heroic aspect. Seeing the people who rose to the top – going out of their way to try to save others. It’s amazing and makes you think how you’d react in the same situation. It’s a true testament to the good in mankind. RYAN: Mark Wahlberg is great. The script is good and has some nice comedic moments with the characters at the top. Kate Hudson grounds it a bit too. And the kid form The Maze Runner, Dylan O’Brien. NATHEN: I liked him. He was very convincing. And they all help you care more about them. RYAN: But there’s this awful, looming sense, waiting for it to al hit the fan, like when you watch Titanic. I was almost sick, just waiting to see what would happen. NATHEN: From the moment it starts, you’re worried about them. RYAN: The suspense and anticipation is maddening. NATHEN: I liked how the film begin – they incorporate reality with the real audio form the trials. RYAN: Kurt Russell is outstanding and then John Malkovich is the best at playing bad in this. You root for him – in the wrong direction, if you know what I mean. RYAN: You an’t help but hate him. And the beginning of the credits were great because it honors those who died in this tragic event. Did you cry? NATHEN: I did a bit. RYAN: It’s incredible on the big screen – you’re a part of it. It’s like you could get PTSD just witnessing it.